Ref. contents: Appendix: S-1902 (1903) articles. 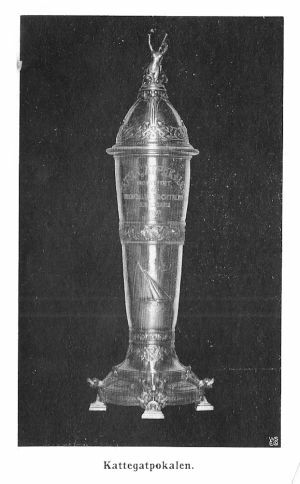 The Kattegat Cup of 1902 and the Copenhagen Cruising Rule of 1898. "The Copenhagen Cruising Rule of 1898"
Since the early days of seafaring and transportation of goods on boats, volume (tonnage) and time (speed) had an impact on cost and income. The most extreme boats were the Clipper yachts sailing from India to Britain with tea. In this “tradesman-contest” the winner was the one who first dropped her anchor at port arrival. Fishermen sailing out and in to the fishing fields experienced the same contest. First boat out in the morning to get the best fishing places, and first boat in to the market in the evening. In 1865 twelve pilot and fishermen boats raced on Hjeltefjorden in Bergen on the westcoast of Norway. 3 years later 280 boats divided in 17 classes raced in Stavanger. Midsummer 1871, 39 boats raced in different classes in Bergen. Classes were divided based upon length, boats in class 3 were between 24 and 30 feet. Rules of racing were laid down, no ballast must be discharged during racing, wide jibs not for use in head wind were prohibited. As such racing between boats became an unavoidable challenge, and with the challenge came the sport where competition was more important than the trade itself. And with the development of the sport means were sought to regulate competition between boats of different sizes, thus introducing handicap regulations. Part of such regulations was measurement rules for classification of boats and development of handicap forms. And during the late 1800 yacht designers around the world presented great thinking in means of measurement rules and rating of yachts to be adapted by their homelands and adjacent countries. Some common development took place. From a tradesman point of view it was natural to classify yachts based upon volume and weight of goods, tons, resulting in various types of volume, displacement measurement rules. (L+B)x(L+B)xB/1730 adopted in 1881 and expired 1907. In Norway the “Girth Rule” T= LxGx(L+G)/135 was officially adapted for measurement of racing yachts from 1889. The rules outcome was tons including length and girth measurements, and was mainly a volume, a displacement rule. The volume, displacement rules had no restrictions on sail area. This resulted in narrow, deep yachts with large sail areas. Another result was change of ballast from inside the hull to hanging underneath. However, the girth factor in the “Girth Rule” did not to same extent favour the extreme narrow and deep hulls. This in line with experienced Norwegian boat designers as Sinding and Collin Archer which focus were on seaworthy, sound and fast sailing ships for fishermen going out and in from sea. While the "volume, displacement" rules was initiated by the thoughts of the tradesman, the “length-sail area” rules were initiated by the thoughts of the racers focusing on speed-factors as length and driving force, sail area. Boat length alone was an easy way to divide boats into classes, however, as sail area had a great impact on performance this was not adequate. In UK Dixon Kemp adapted the principle rule M= (LxS)/131. USA had a similar rule, the Seawanhakarule; M= (L+sqrtS)/2, which was adapted by GKSS in Sweden in 1885 and made valid until 1904. In 1891 the US designer Nath. G. Herreshoff constructed the yacht “Gloriana” which represented a new way of thinking. Thus taking into design consideration the hull shape above water and effective waterline length at healing, while keeping the measured waterline in the measurement rule down. These “length – sail area” rules resulted in extreme racing shells, shallow flat bottom hulls with fin keels, centreboards and large sail areas, of which the most extreme only lasted a few seasons. Thus going from one extreme to another. Swedish designers as Albert Anderson, C.O. Liljegren and Axel Nygren rapidly adapted Herreshofs way of thinking in the 1890ties. 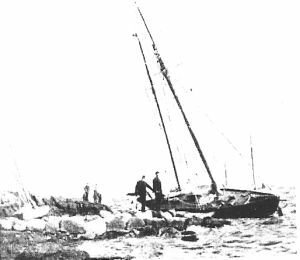 In Finland the development of shallow flat fin-keeled yachts took off by Finlands own designers W.Stahl, Emil Wegelius, and Gustaf Estlander with “Singoalla” 1898. Finish yacht racing had developed in cooperation with their neighbours on the east coast of Sweden in the 1880-ties. 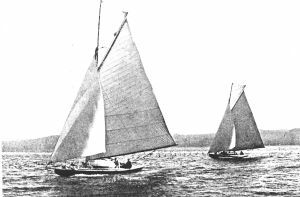 The Finish had little experience in designing racing yachts and their own designs were beaten by the Swedes which resulted in ordering yacht design and drawings from abroad, UK, Norway and America, from designers as Colin Archer in Norway; Watson, Fife, Payne and Dixon Kemp in UK; Burgess and Herreshoff in USA. From 1889 to 1896, some 28 yachts were designed by foreigners and became the basis for Finish designers as Gustaf Estlander. In Norway the “length –sail area rule” [LxGx(L+sqrtS)]/165 was adapted, holding on to the girth (G) being a factor in the measurement rule. In Denmark volume, displacement, yacht-ton Y.T. was the measurement rating as in Norway until the first conference in Copenhagen in 1893 where Alfred Benzon suggested a rating formula also including sail area. Rating sail-ton S.T. “Sail length” – “Sail Metre” (The Copenhagen rule of 1898). Of new elements in the rating measurement rule were the becoming famous little “d”, i.e. the difference between hull frame girth and straight girth, and “F” freeboard height. Length L to be measured 5 cm above floating waterline. If total overhang exceeded 50% of L the surplus to be added to L.
9.65 sl. "Brand", Johan Anker 1899, (Sail-length rule - Copenhagen Racing rule). The strong relationship between the Danish, Swedish and Norwegian sailors around Kattegat and their common interest in working for a safer and sounder development of the sport resulted 1902 in a proposal from Royal Yacht Club, Kristiania, K.Y.K. (later renamed KNS) to have an annual challenging Cup regatta between G.K.S.S representing Sweden, K.D.Y. representing Denmark and K.Y.K. representing Norway. The cup named the Kattegat Cup was to be raced for by one yacht representing each club. The yachts to be designed, constructed and fitted out in the country they represented. The yachts should measure less than 9 sail-meters under the Copenhagen Cruising Rule of 1898. Handicap was not applicable. Yachts outfitted with bulbs, centreboard or fin-keel were prohibited. Helmsman must be an amateur. Yacht construction methods, scantlings to be agreed. As such the Kattegat Cup of 1902 and the Copenhagen Cruising Rule of 1898 may be regarded as the first Scandinavian Rule (S-rule). The Kattegat Cup represented for years to come continuity in the racing relationship within the Scandinavian Yachting Society. 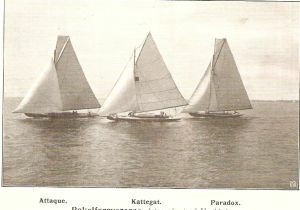 The first Kattegat Cup races took place in 1903 and the winner was “Verana” representing K.D.Y., Denmark beating "Kattegat" representing G.K.S.S, Sweden. "Magda 3" representing K.Y.K , Norway did not start. She shipwrecked during the storm the night before. Unfortunately to her owner Alfred Larsen who had brought forward the idea of a common challenging cup between the three Scandinavian yacht clubs. His proposal had been consented by K.Y.K in their meeting on February 13th. 1902. "Kattegat" G.K.S.S. and "Verana" K.D.Y racing in 1903. "Magda 3" K.Y.K. shipwrecked in the storm the night before start. Denmark also won the Cup in 1904 with “Paradox”, while “Princess Margaret” representing G.K.S.S, Sweden won in 1905. “Brand 2” designed by the Norwegian Johan Anker won in 1906. 9m. "Brand 2", Johan Anker, winner of the Kattegat Cup 1906. In 1903 one man was killed onboard the America Cup defender “Shamrock III” as the mast broke during trial. More deaths occurred as sailors were swept overboard from another American boat. The development in US yacht design had gone in the same direction as in Europe with, centreboards, fin keels, bulbs, shallow flat hulls with long overhangs. This development had to come to a stop because of lack of sufficient construction methods at the time, no aluminium, no glass fibre nor carbon. Thus forcing American yacht design into a general, safer, saner shape and type. 1903: Finland and “The American Quarterbeam Rule”. The Finish sailors kept an open eye to the international yachting world, and as the boats got more extreme they also were looking for more safe and sound designs. In 1903 the world had experienced the loss of sailors onboard the American Cup yachts, and Herreshoff introduced his Universal Rule in America. The Finish settled that year for the American Quarterbeam Rule which they made valid until 1907. The Copenhagen Rule of 1903. The Scandinavian sailors had experienced the same development in yacht design under the Copenhagen Racing rule of 1898 as took place in the rest of the world. As such a third conference took place in Copenhagen in 1903 where it was agreed to abandon the Copenhagen Racing rule of 1898 and only extend the Cruising Rule until 1907, which was the same time as the “British rule” expired. This in accordance with the decision made by the Scandinavian countries in 1902 in respect to the Kattegat Cup. In continuation of the conferences in Copenhagen in 1903 the work for an international rule took place with conferences in London in January and October 1906. The attempt was to agree upon an international rating rule for racing between yachts divided in classes without handicap. Present at the meetings were British, German, French, Austrian, Swedish, Danish and Norwegian sailors. It was a common understanding that the ongoing development in yacht design and international competition called for common rating rules and construction methods encouraging more sound, seaworthy and cruiser friendly yachts. As such it was of great significance that the rule was accompanied by construction requirements, scantlings, to be controlled by Certifying Authorities as Lloyds and other classification societies. The proposal was a compromise beween the Scandinavian/Germans and the British. The rule consists of the same elements as the Copenhagen rule. As such the Copenhagen rule was a forerunner to the first international rating rule to come - the R-rule of 1907. However, the rule did not come into being without critics. In KSSS, Stockholm, yachtsmen felt the rule would encourage narrow yachts with great sail areas and not become as expected. The reduced penalty factor on "G" and increased penalty on "d" would compared to the Copenhagen rule promote a more V shaped hull, although the increased penalty on sail area would encourage more wolum and less sail area. As an outcome the Swedish designer Ljungberg in 1908 presented his Squaremeter rule which for years became a very popular rule on the Swedish East Coast and in the Baltics. USA did not ratify the R-rule of 1907 as their designers for years to come held on to the “Universal rule”. Prior to the ratification of The International R-rule in 1907, also known as the “Metre-rule”, most international competition was always subject to various forms of handicapping. These were often subjective and certainly open to protest. One exception was the Scandinavian Kattegat Cup of 1902 where handicap was not applicable. This first International R-rule was made valid for a period of 10 years from January 1st 1907 to end of December 1917. Yachts with construction method and scantlings approved by Certifying Authority, and measured in accordance with the International R-rule, were given the right to be Certified as belonging to the International R-Class. R stands for rating in sail-metre (s.m.). The critics proved to be right. Over the years prior to WWI the yachts became more narrow and V-shaped with more than 20% increased sail area. Designers agreed that the development was going in the wrong direction. The introduction of Marconi rig and Bermuda sail plan on Eights and upwards further called for modification. Present at the conferences in London in 1906 was also the Norwegian delegate Johan Anker who in his youth had studied naval architecture in Germany. Anker together with Benzon and Ljungberg played an important role in the modification of the international R-rule of 1907, known as the Scandinavian S-rule of 1917, and the development of the new International R-rule of 1919. In the late 1920-ties (1928) early 1930-ties USA came around and ratified the amended R-rule of 1919 for classes 12m and less, from which period of time the R-rule became true international. Go to Contents: Appendix: S -1902 articles.